The Simpson Strong-Tie commitment to product design and testing over the years has resulted in us taking a whole-systems approach to building design. One of the key milestones that launched us down this path was the development of our first factory-built wood shearwall — the Strong-Wall®. Our prefabricated shearwalls improve the quality, consistency and performance of shearwalls in the field. 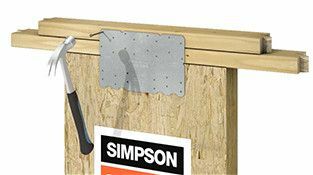 Simpson Strong-Tie has two products in our prefabricated shearwall family, the Steel Strong-Wall® (SSW) and the Strong-Wall wood shearwall (WSW). The Steel Strong-Wall shearwalls conform to ICC-ES Acceptance Criteria AC322 and are code-listed under the 2015 IRC/IBC (see ICC-ES ESR-1679).The Strong-Wall Wood Shearwall is code-listed to the 2015 IRC/IBC and conform to ICC-ES Acceptance Criteria AC130. The latest addition to the Strong-Wall family is our new Strong-Wall site-built portal frame system (PFS). The PFS is a kit of parts that provides Designers, engineers, and builders in prescriptive markets with an easy way to meet code-required wall-bracing requirements for garage portal frames or other wide openings. The PFS is a cost-effective option to site-built walls by providing a turnkey solution while maintaining aspect ratios and design features. The PFS can significantly cut contractor time on-site and reduce call back issues associated with complex site-built alternatives. Working with specifiers, builders and contractors has given Simpson Strong-Tie insight into the needs of the various players in the design and construction process. This insight has enabled Simpson Strong-Tie to design a composite shearwall that features some of the highest allowable loads in the industry while offering the easiest and fastest installation: The Steel Strong-Wall shearwall. The new Strong-Wall Wood Shearwalls offer the latest product enhancements with front, back and side access holdowns and top-of-wall connection that allow for easy installation and inspection in various framing conditions. The Strong-Wall Wood Shearwall delivers greater lateral-force- resistance performance than most comparable wood shearwalls while providing installers the ability to field-trim the shearwall for customized heights and rake walls. The Strong-Wall site-built portal frame system (PFS) provides Designers, builders and contractors in prescriptive markets with an easy way to meet code-required wall-bracing requirements with narrow wall widths. Simple and quick to install, the PFS is a cost-effective alternative to IRC braced-wall solutions. The original legacy Wood Strong-Wall shearwalls are being phased out. Simpson Strong-Tie will guarantee availability until December 31, 2018. We currently have two prefabricated shearwalls that can be used as replacements: the Strong-Wall Wood Shearwall and the Steel Strong-Wall. Visit our Legacy Wood Strong-Wall® Rationalization FAQ for more information. The legacy Strong-Wall shearwall can be installed around window and door openings, on garage wing walls, interior walls or any other locations where increased lateral resistance is required. Strong-Wall shearwalls can reduce the amount of wall space required for shearwalls, allowing for more windows and doors in house designs. The complete reference for product, application and technical information for our Strong Wall wood and steel shearwalls, including engineered design solutions. The new Simpson Strong-Wall Shearwall Selector web app lets you choose the appropriate Wood or Steel Strong-Wall for a particular framing and foundation application. Learn more about the installation sequences of the new Strong-Wall wood shearwall in our video collection. The collection includes an installation overview and more in-depth installation videos on the wood shearwall, anchorage, top-of-the-wall connection, and multi-story kits.